Love is an emotion that permeates all aspects of life. We love our families, our partners, our pets and many more! Without a doubt, love is one of the most powerful emotions that one can experience, yet many of us spend so much time focusing on loving everything around us that we repeatedly forget the most vital recipient of love: ourselves. Start being kind to yourself and don't beat yourself up. A certain amount of introspection is good but if you're frequently focusing on your flaws and failures, you tend to develop a distorted sense of self. Remember that when you are kind to yourself, the positive energy will definitely shine through making it so much easier to accomplish your goals. Do what you love. This could be singing, travelling, dancing or even just sitting quietly and sipping on your cup of tea. It's important to feed your soul with jubilant activities as that happiness will reverberate through your life and extend to the people around you. 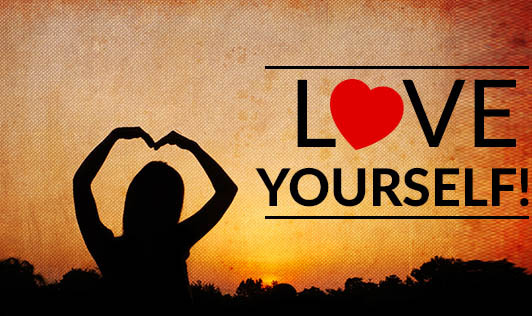 Spend time with yourself because the better you know yourself the easier it is to love yourself. One of the best ways to do this is to spend time alone. You can read a book or go for a walk. The amount of time you spend with just you will help you become more grounded and you will be better equipped to battle to negative emotions and live happily. Surround yourself with positive people who are caring, supportive and non-judgemental and you will feel loved, respected and appreciated. Studies have shown that people who associate with cheerful people, have a better sense of well-being. Take good care of yourself. Make an effort to take care of your body by eating healthy, getting enough rest and exercising regularly. Manage your stress levels by meditating. Take the initiative to look after your emotional and physical well-being and you will see your confidence and sense of self-worth grow.